Yes. It’s a bold title. And yet it truly befits the magnitude of what we’re up to with this project. If you’ve found yourself here, I’m going to assert that it is not by accident. So often in life we find ourselves experiencing cycles of ineffectiveness. The cast of characters may be different — but the scenarios remain the same. We realize that we are the common denominator in all of these instances — and yet we may feel trapped or resigned that this is our lot in life. THE ANSWER To Absolutely Everything! 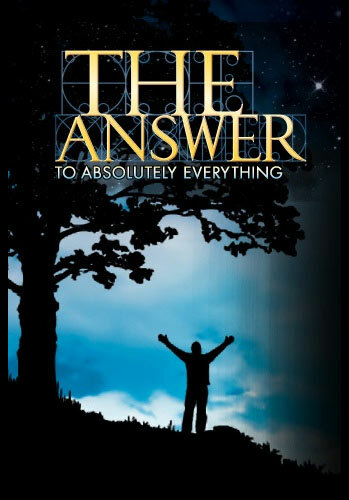 is a new DVD/movie that boldly explores the metaphysics of success. It gives you a road map to navigate and powerfully accelerates your life in the areas of health, wealth, relationships, self-expression and wisdom. My business partner and co-executive producer, Ed Madison, has been an innovator in the media world; first as a founding producer at CNN, and more recently, through various contributions to most of the major studios and networks in Hollywood. One day, Ed and I watched “What the Bleep Do We Know?” and “The Secret” and were moved not only by their messages but by the tremendous number of people they inspired. Together we saw an opportunity to utilize the profound power of media to provide the public with unique and deeper insights on the principles of transformation. It would be easy to misjudge our intentions. THE ANSWER To Absolutely Everything is NOT “The Secret 2,” “A Better Secret,” or “The Real Secret.” The possibility available through this work is so vast and powerful that it defies limitations. It would be short sighted to believe that any one person, group or project owns these truths. We live in an abundant universe that has more than enough room for numerous expressions of wisdom.